Bookshelves lined the walls. Waiting piles of our kids’ “treasures” stacked in corners reminded me to sort and pick a few favorites. Boxes of pens, pencils, papers and nick knacks cluttered each surface. Marker masterpieces of days gone by whispered stories, stories of those naughty days when walls were much more enticing than paper or coloring books. And then that carpet, oh my, the carpet. Laid when the glorious days of Ally McBeal, Teletubbies, Titanic, preppy pink and green and slouch socks worn over sweat pants were all the rage. Yes, 1997 was a glorious year, but unfortunately, my dining room still held the remnants in every nook and cranny of that time when our house was first built. I think many of us have at least one room in our home where time stands still. It’s that room that you’ll eventually get to, but days turns to weeks turns to a year (or 17). With these pictures that I’m about to unveil, I am taking the blinders off. Any of you who once asked me decorating advice, feel free to point and snicker. I’m closing my ears and guarding my heart. It was bad. How did it get so bad? I like to use the excuse of homeschooling five children for nearly 16 years, with an over the top love of books. Yes, that does elicit a bit of sympathy. Honestly, life got in the way of this room. Excuses made, new goals set, which didn’t include tackling this. Every time I would think about clearing it out to paint, those huge bookshelves with the hundreds of books would scoff at me. But if there’s one thing I know now, I wish I would have prioritized this years ago. A few months ago, I came across this piece at a yard sale and it began a small step towards moving out of the 90s era. This was in the middle of boxing up those hundreds of books. I called in reinforcements for help. I know, you are all gasping that I got that gorgeous piece at a yard sale. Believe it or not, but I walked away initially because they wanted $500. Now, it is well worth $500 because it was from furniture market priced at $2,500. I had planned on going with more of a French Country Cottage look in that room, so I left my number and told him if he was ready to move, and hadn’t sold it, give me a call. 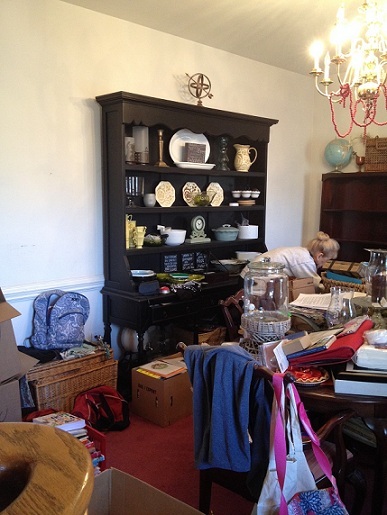 A dramatic difference occurred by just de-cluttering that one wall, and adding the hutch. It started to actually feel like a grown up room, and that was still with my primer white walls. Some of you are waiting to redo a room due to budgetary constraints. But don’t wait! Look around. Shop the house. It was a big task to remove all but one of my book shelves, but it allowed me to enjoy it so much more. Since we knew the floors were coming, I wanted to take advantage of being able to drip right on the carpet and so I spontaneously painted. Once the walls were painted with a beautiful Sherwin Williams grey/blue, depending on the time of day, I stood back and gasped at the difference. I even enjoyed it like that for a full day WITH the nasty pink carpet, and I barely noticed the extra large builder brass chandelier. I’ve mentioned so many times before what a difference paint can make and this really proved it. But how would I ever have known that once the carpet was removed and the new flooring put down, it would turn into a showcase room? I mean seriously. I kept looking at the dining room like I had moved into a new home. I must have texted the before/after picture to at least ten friends because I knew they would never believe the transformation. Our youngest daughter wanted to keep it as a dance ballroom – it just has that Cinderella effect. The room had doubled in size or so it seemed and my mind soared with all its potential. Can you even believe how gorgeous those floors are? As I mentioned in my last post, Tips for Picking out New Flooring, it was a hard decision, but this choice is stunning. The hand scraped laminate mimics a hardwood and to the untrained eye, I think it’s virtually impossible to know that its laminate. I love the width of the planks, and I can’t wait to decorate, but here’s the catch. Real life isn’t one huge, grand, “I’ve changed every aspect and detail” before/after room reveal. While that is definitely an amazing amount of fun to watch on HGTV or view on your favorite design blog, it’s not real life for most of us. I am showing you my big grand reveal that is just as sweet as any of those because in my waiting, I have so much more appreciation for it all. I am so thankful! 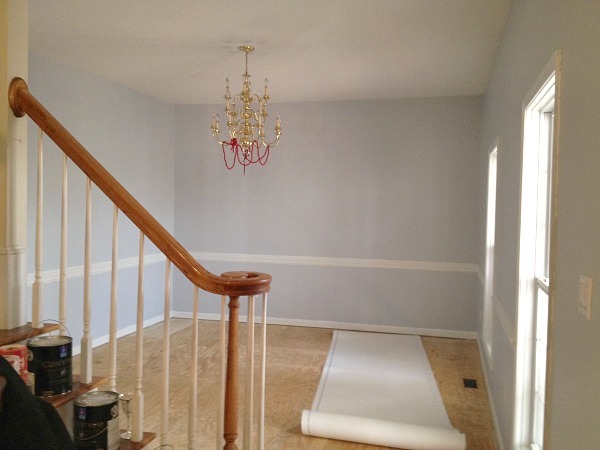 I mean, these floors, and this color of wall paint are unbelievable! 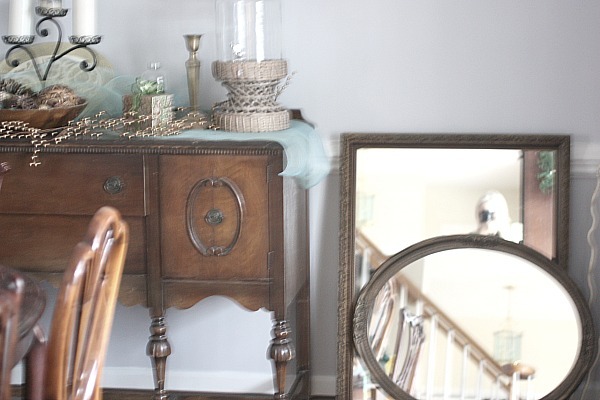 This is a reveal that I will revel in and enjoy for months and then maybe this spring, I’ll think about updating my chandelier, mirror and style this hutch. Then during the summer time, I’ll replace or paint one piece of furniture and maybe add a huge rug under the table. Slow down and enjoy each, tiny, little step of the journey. Encouragement comes from the process, and it’s in those moments when the best of life happens. And for the many of you that will ask for all my sources, here goes. I adore the Sherwin William paint sales and stock up when they go 30-40% off. This color started as Evening Shadow, which I love, but once I started painting, it was a tad too similar to my kitchen color, so I brought it back into the store and they lightened it up a bit. Big Painting tip: If at all in doubt on paint color, start with a lighter shade. It’s much easier for them to darken the paint then it is for them to lighten it like they had to with mine. I am a huge fan of Purdy Paint tools. We had many dry wall spots that needed to be fixed and their Prep Tools are great for scraping and filling in. I used to buy any roller or brush that was on sale, but I no longer do that. As much as I want to watch my pennies like the next person, investing a few extra dollars in quality brushes that won’t leave little pieces of “hair” on the walls is so important. Brushes and paint kind of fit into the overwhelming, “What should I purchase?” decision, so by staying with quality products, I know I’m guaranteed good results. I use their Clearcut Angled brush for ease in cutting in with accuracy and recently started using the Mini rollers too. They are perfect for so many little touch ups that I do the second day when I find spots I’ve missed. I hate cleaning big rollers. The exact Mohawk flooring I had installed is from the Ellington Line: Rustic Saddle Oak Laminate and it’s gorgeous. This style is timeless and I see us enjoying this for decades. It comes with a ScratchGuard™ Advanced Finish Protection finish which will hold up well in all our high traffic areas, essentially 90% of our down stairs flooring. And since I firmly believe in taking my time and enjoying this whole renovation process, this is a picture I just came across that is nearly identical to our dining room. Same floors, same wall color and we have the same windows. It’s a bit fancier than our lifestyle, but it’s fun to envision the potential for this room. DO you have any plans for redoing one of your rooms soon? Let’s dream together. What is your next step? 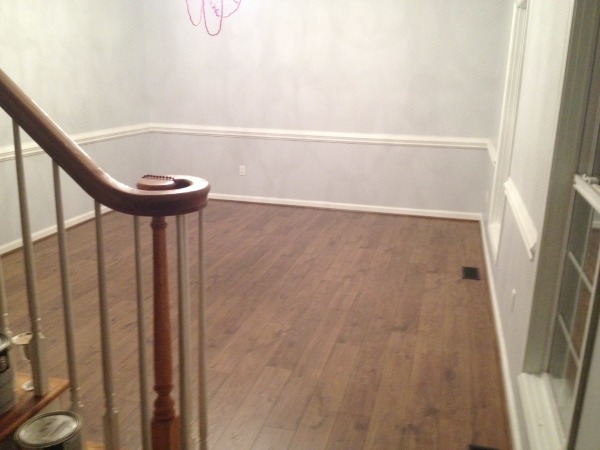 *Mohawk provided flooring as part of the Mohawk Floors me program, while I paid for all installation and labor. 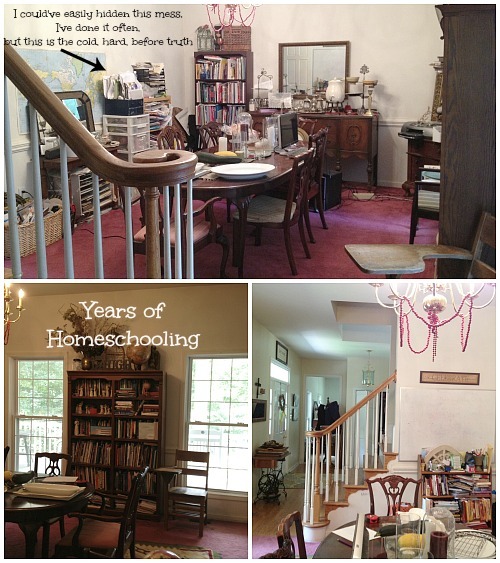 It’s amazing how much stuff we collect over the course of homeschooling! 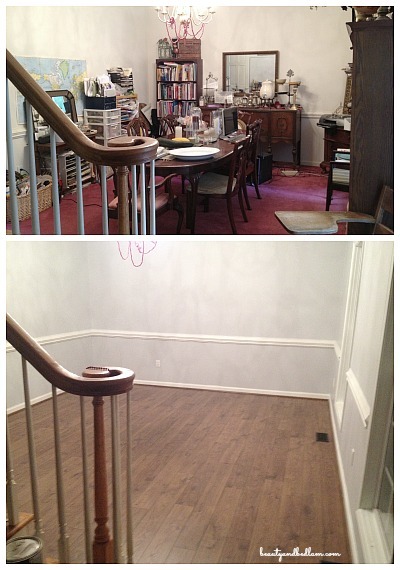 I LOVE the floors and can’t wait to see the whole room put together Jen! The flooring looks great! I want to replace the carpet in our living room/dining room with wood (when the carpet wears out), and I love those floors. It’s BEAUTIFUL, Jen! What a remarkable difference – and so classy. Unbelievable what new flooring can do. I pinned the Mohawk Ellington laminate to my dream kitchen Pinterest board – love that it’s so durable and still looks so classy! Oh, Jen….THIS makes me wish we lived closer to one another. I’m not great at making choices but I always appreciate befores/durings/afters. Yours is stunning, even if it’s not quite finished. 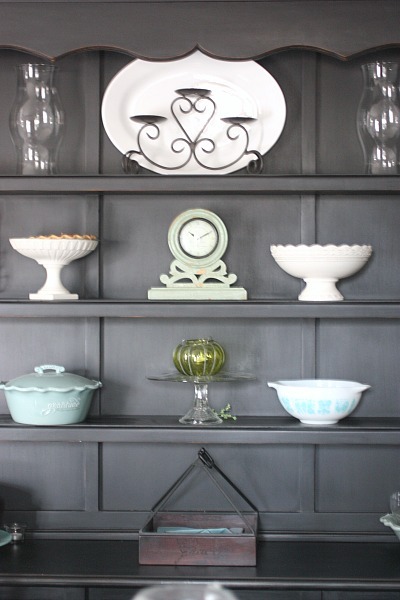 An interim fix for your light fixture is to spray paint it black matte. We did that with brass fixtures of ours and the difference was fantastic for a few dollars! And….we’re buying a new house! Sooo….I’ll probably be asking more questions down the road :). 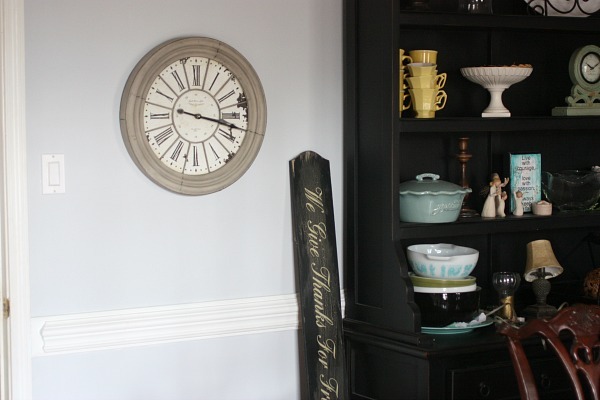 Planning on repainting the 1st floor and updating the decor a bit – just waiting on the 40% off Sherwin Williams sale!!!! I know. That is exactly what I did, but then I did have to break down and get some more at 30%. 🙂 Now I now that you can buy it untinted and go back any time to have them add the color. Plus if you decide you don’t need it within a month, you can return it. That is great because I can get more, rather than run out and need to pay full price to finish a job. Beautiful! Thanks for info. Love the idea of buying paint untainted on sale. How do you do touch ups 2nd day? We recently painted our bedroom. Tried touching up full strength paint and watered down paint. I have been doing the touch ups full strength and haven’t had a problem with blending. One funny story though about how important it is to touch up in good light. A few years ago, I spent about four hours touching up white trim, stairs, doors etc. When I woke up, I realized I had grabbed my slightly OFF WHITE paint and now everywhere around my house had “dirt” spots from my touch up. It was painful and I hate to admit that a bunch of it stayed for a long time after that. I homeschooled for 21+ years- 6 of my 8 children. So I know very well what you mean about the room, but you have done beautifully. Jen, it’s beautiful! And I actually love your befores too. Those photos look so much like my house over the years. And my dining room still looks much like that. Toys, games, school work. It’s the play room we don’t have. Houses are meant to be lived in and loved in. You’ve used yours well. Thanks for sharing it all! Love this. I am loving your gorgeous floors. We are redoing our floors in a couple weeks. It will be crazy, but I can’t wait. Hope the end turns out as polished as yours. Simply gorgeous! I’m getting ready to paint the dining room and giant built in hutch. So ready for a change especially since it’s the middle room of the house. You literally have to walk through it to go to any other room. I’ve got $125 and a little courage. Now I just need the right color! GO for it!! You will be SO glad you did and you’ll have to send me a picture. It will look great. I can’t even believe how much just giving my walls a fresh coat of paint and also painting the molding a fresh, glossy white, changed it up. I painted a hutch last year (did you see it). It was an 80’s brown and I painted it white with a pop of blue in the back. I never regretted it. It made the whole room. Oh that is gorgeous! That hutch is very pretty, too. Nice work. 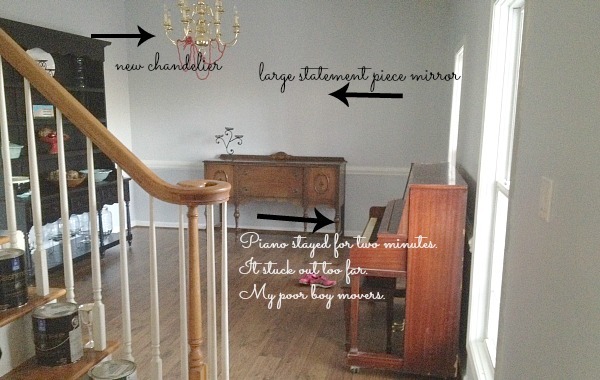 I can see those two mirrors layered just like you have them on the floor on top of the sideboard. 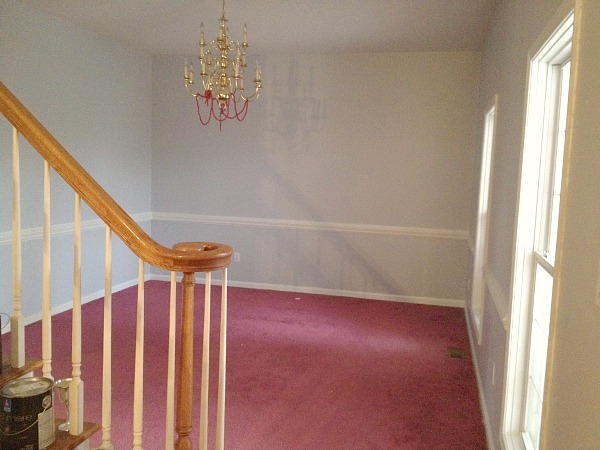 And that chandelier is just one vibrant shade of spray paint away from awesome. It’s a very pretty shape. So fraught with possibilities! Congratulations, and have fun with that room. This looks like it has been a fun, and well thought out project. 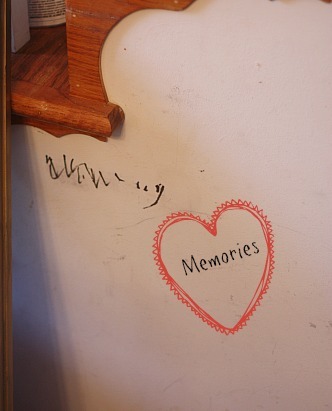 We’re in a rental at the moment; decorating and household projects is something I miss greatly! I live vicariously through Pinterest and such! Jen it’s GORGEOUS!! I’m doing the same thing in our family room! so far the new paint colors make it feel like a new room, but new floors (ripping out the old nasty carpet) would complete the room. I LOVE the laminate you went with! Dreamy and refreshing! I pinned that same dining room photo as inspiration for ours- the wall color in that room looks like my daughter’s SW Dewy walls, but downstairs again it will go! 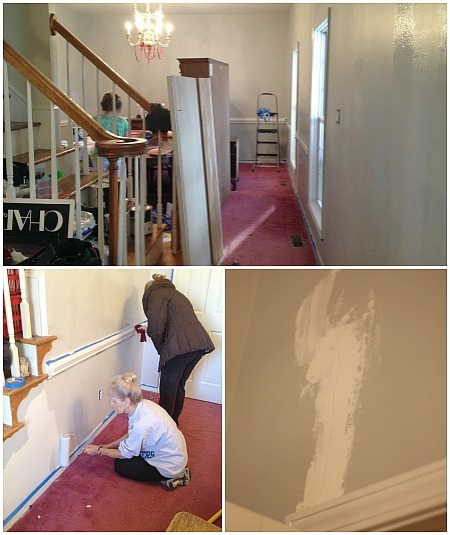 A living room redo caused touch-ups in the dining room and 10 years later, paint touch-ups are no match. It doesn’t help that I touched up the entire room- I know better, but did it anyway to ensure that I would just repaint it all. Now for the 40% off sale! oh Heather – did you see my comment below? I touched up walls for four hours late one night and woke up and it was an off white shade causing it to look like mud splotches everywhere! UGH! @Jen, Ah, yes, the chores we do late at night while others are sleeping! I haven’t had the motivation to do any nighttime projects in a while. I guess that is a good thing- for the sake of the house! Beautiful! 🙂 We just installed dark hard wood in our main living area, and I can completely relate to how having that 1 change is so major to the feeling of the room. Good job! Love the flooring – it is just amazing! My husband AND I have such a hard time with “waiting” when we are working on a project – we always want it done, well, like YESTERDAY! LOL! We are learning that waiting can be half the fun of a project and in our new little, bitty house we are going a little slower and enjoying the process so much more! Oh my! That reminds me so much of my dining room, aka scrap booking room, aka husbands office, aka dumping grounds. I am so motivated to go do it! Go for it!! Just a few changes makes SUCH a difference! Could you share the paint color/brand that was used on the dining room walls with the rope lighting? What is the paint color in the dining room posted on this site? This light green? Where did you get the chairs in your dining room in this picture? They are exactly what I am looking for.